Did you know that the everyday objects that surround us have stories to tell about the past? Students using this trunk will explore Kansas history through the quilts women made and used from the early days of settling Kansas to the recycling of the 1930s to our contemporary world. Quilts, objects, historical documents, photographs and more enable students to explore women's roles and responsibilities in settling Kansas. The lessons in the trunk's manual offer opportunities for teaching social studies, reading, math, and art for fourth through sixth grade youth. Students examine immigrant guides and a packing list. 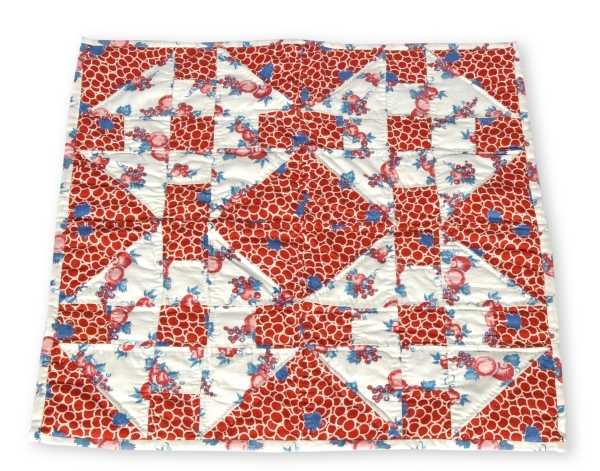 Pages from a 19th century mail order catalog and the geometry of pieced quilts connect math into the study of rural free delivery and fabric. The Great Depression of the 1930s is explored through the use of feed sacks for clothing and quilt making. The women of First Presbyterian Church in Newton entertained women and young "women" at our "Tea At Two". We supplemented the contents of the trunk with many, many quilt projects loaned by members of the church. It was a great display and much appreciated by all who attended. Dimensions: 31" x 22" x 16"
The Kansas Historical Society developed the Kansas Women and Their Quilts traveling resource trunk with partial funding provided by the Kansas Quilt Project, Inc. and the Kansas Arts Commission.